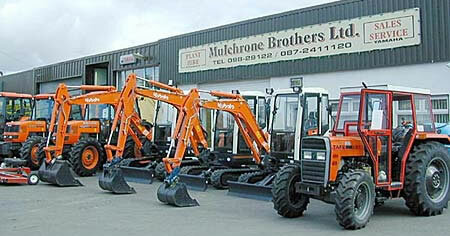 Mulchrone Brothers Ltd is a household name in the West of Ireland in agricultural plant hire for the past 25 years. While serving the farming community was our reason for going into business in the mid-seventies - and still remains one of our top priorities - we have expanded our operations over the years and now serve all businesses, industry, local authorities and other public service agencies. 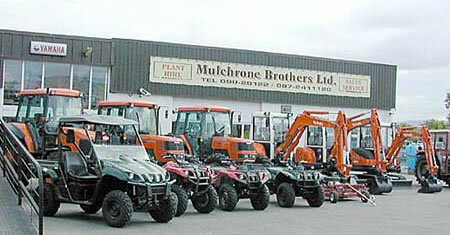 The Mulchrone professionalism has long been recognised by our main machinery suppliers and not surprisingly, we are the main agents for Kubota Tractors and groundscare products including RTV as well as Yamaha ATVs, Woods trailers, Nugent trailers and a huge host of other brands of agri, plant and groundscare equipment. We supply for hire on demand excavators from 0.8 to 13 tonne, dumpers, tracked dumpers, road rollers,telescopic handlers, light towers, trailers and a huge range of other items. Please browse our catalog and if you need any assistance or require more information about a product then contact us and we'll be more than pleased to help.